Denis R. McDonough (born December 2, 1969) is the 26th White House Chief of Staff. Jack Lew was Chief of Staff during President Obama's first term. ↑ The Washington Post (2013). 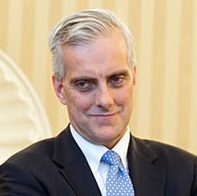 Denis McDonough to be Obama’s new chief of staff. Retrieved 30 January 2013. This page was last changed on 12 March 2019, at 05:52.